Can the US auto industry recover after one of its worst months ever in October? 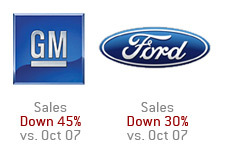 General Motors and Ford just released their October sales numbers, and the data wasn't pretty. October sales for General Motors tanked 45% from October of last year, an incredibly violent drop that comes as the result of a "Perfect Storm" of different maladies that are working against the company. Ford didn't fare that much better in October, reporting a sales drop of 30%. General Motors reported that light truck sales were down 51% from October of last year, while passenger car sales were down 34%. The numbers are quite staggering when you translate these numbers to total vehicles sold. General Motors sold 168,719 total vehicles in October. This is down a staggering 138,689 vehicles from just a year ago. Ford reported that they sold approximately 57k less vehicles than in October of 2007. That is an unbelievable hit to the industry, and that is just two of the major auto manufacturers (Toyota, Honda and others all reported large YoY drops). Industry analysts and GM executives have stated that October will be the worst month of the post-World War II era on a population-adjusted basis. 1. Tightening credit. Credit is tight right now - lenders are doing whatever they can to limit their risk. GMAC Financial Services recently announced that they would require a credit score of at least 700 to obtain a loan. That shuts out MANY people who would have otherwise bought. I've heard from many people that obtaining a car loan is much, much harder than it was just a year ago. 2. High gas prices. Gas prices are coming down but they are still high, especially in relation to the shrinking incomes that many people are having to stomach right now. Many families are making due with one car. 3. Low consumer confidence. Confidence in the economy is extremely low right now. Many people are fearful about losing their jobs or suffering heavier losses in their 401ks. Many people are postponing new car purchases until the economy starts to turn around. Cars in this day and age are usually very durable, and many people are simply deciding to continue to drive their old cars to save money, instead of buying new ones. 4. Less disposable income and lower net worth. Many people are upside-down on their mortgages and can not take out a home equity loan to finance the purchase of a new vehicle. Many people are having to cope with themselves or their spouse losing their jobs. Many people have seen the value of their investments erode greatly over the past 12-18 months, and simply don't have the extra cash to justify a new vehicle purchase. These four things are conspiring to cripple the US auto industry right now. GM and Ford are currently on life support right now, and the situation is very dire. I'm not exactly sure what they can do to turn things around.